We Support Performance & Visual Arts Education. 100% of your donations help bring essential art and music programs to our schools. Join us at annual Piedmont Maker’s Faire at PAF Artcade booths. There will be fun art and music activities for everyone at Beach Elementary School (100 Lake Ave, Piedmont, CA 94611 ) Sunday, April 28th, 9-3pm. Some fun activities include Raul Jorcino leading a big paint/Art Sculpture, Larraine Seiden leading the Weaving Tree, Dragon School, Stop Motion, Face Painting, Pottery, Pinball Machines, Quilting Bee, Yarns, Wood-making. 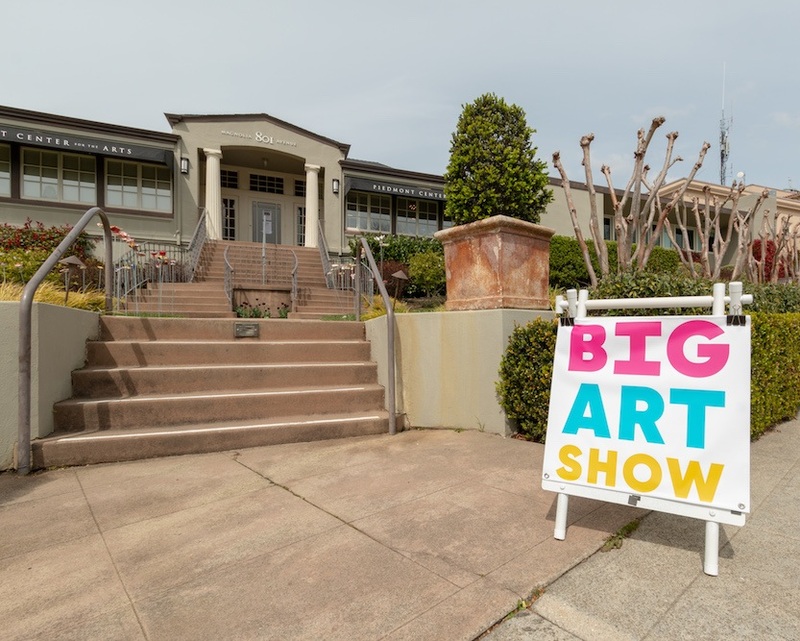 The Piedmont Arts Fund Big Art Show closed on Saturday March 30th, 2019 with a recital by students in the Piedmont Unified School District. The 3rd Annual Big Art Show ended with many artworks finding new homes in Piedmont. Students played at the Piedmont Center for the Arts to a full room. The recital featured Phoebe Kim (the youngest, a 1st grader at Beach Elementary), Charlotte Zhang on the piano, Josie Schuetz and Jane Lin playing a daughter/mother violin duet, Kasandra Dagnese on the violin, Jasper Schuetz, Jonah Kim, Evrim Duransoy, and Milo Bakshi, each playing piano, and Matteo Scanu and Aaron Brahma playing an electric guitar duet. It was a delightful end to a month of artistic events held at the Piedmont Center for the Arts, which included hands-on art activities and a student film screening hosted by Piedmont High School senior Alfonso Hollingsworth. The Piedmont Arts Fund wants to acknowledge the many volunteers that made these events possible and all the community supporters who came out to support the events. Over the two weeks from the Piedmont’s Got Talent Show to the Closing Concert of of the Big Art Show, we saw that visual and performing arts are thriving due to the generosity and support of the community. The Piedmont Arts Fund will continue to put on events to showcase the artistic abilities of our students and fundraise to support music, performing, and visual art programs in the Piedmont schools. To keep up to date on upcoming events or to donate! The Piedmont Arts Fund’s Big Art Show began with the Piedmont’s Got Talent Show and the opening reception for the Big Art Show on March 16. Art from local artists is on display (at Piedmont Center for the Arts), and for sale online at https://pef.schoolauction.net/paf/catalog. The proceeds from this fundraiser supports arts programming at the Piedmont Unified School District. The show comes to a close on Saturday March 30. The Gallery Hours have featured workshops led by local artists, including silkscreen printing with Maggie Mittan, quilting with Amanda Ward, comic book illustration with Yancey Labat of DC Comics, and watercolor and collage with Christiana Reining. After the Piedmont’s Got Talent performance (see below), the crowd headed to the Big Art Show Opening Reception for a festive party at Piedmont Center for the Arts. With over sixty works of art displayed by 27 artists, the juried Big Art Show is the main fundraising event for Piedmont Arts Fund. Artists receive 50% of the proceeds from their art that is sold and the other half directly supports performing and visual arts in Piedmont schools. Siobhan Hughs, art show chair, is very happy with the breadth of 2D and 3D art submitted, including photography, wooden vessels, and ceramic pieces. Stacey Isaacs of Compass Realty donated wine and Montgomery Flowers, Eva Liang and Rick Wu provided flower arrangements at the Big Art Show. Gianluca Bini, Jackson Lommen, Owen Blanford & Torsten Olson. Band. Evelina Mitchell. Piano & Voice. Sophie Eng, Caroline Collins, Sophia Hiestant, Maya Kumar, Cece Johnson, Maggie Sullivan, and Klaire Cherryhomes . Dance . to all performers at Piedmont’s Got Talent! Jonathan Ring (San Francisco Symphony), Emily Keyishian (Actress), Keri Elmquist (Actress and Artist), and Rosemary Orozco (Channel 2 Weather). All Participants: Front row, sitting (l to r): Giselle Bahri Tindall, Michael Peng, Benjamin Sachs, Jackson Lommen, Owen Blanford, Torsten Olsen, Gianluca Bini; Middle row, kneeling (l to r): Miles Antaya, Charlotte Lichens, Gabrielle Garcia, Natalie Lim, Sophie Eng, Maggie Sullivan, Caroline Collins, Sophia Hiestand, Klaire Cherryhomes; Back row, standing (l to r): Kevin Humphreys, Grady O'Gara, Samantha Cheunkarndee, Blaise Harrison, Audrey La Jeunesse, Alfonso Hollingsworth, Caitlin Boothby, Jackson Thornborrow, Caitlin Gong, Ella Vo, Evelina Mitchell (missing Katherine Graham, Vivian Hung, Erin Sturdivant). The Piedmont Arts Fund, formerly PAINTS (Promote Arts In The Schools) and CHIME and partners with PEF, presented the Piedmont Unified School Board with a check for $65,000 in grants to Piedmont Unified School District (PUSD) for the 2018-19 academic year. The Big Art Show at the Piedmont Center for the Arts is open between March 16 and March 30th, 2019 with proceeds supporting the Arts throughout the Piedmont Unified School District. Attend our Board meetings at the Piedmont Education Foundation Office (next to Veterans Hall). map. PAF is looking for volunteers to help with Spring 2019 activities:- e.g. the Maker Faire ArtCade. If interested, please sign up > HERE! Stop by Piedmont Center for the Arts to see 60 artworks by 27 local professional artists. Help raise funds for music, visual and performing arts education in Piedmont schools. Catch a screening of student films today at 3:30 and students performing in a closing concert on Sat at 1pm. www.PiedmontArtsFund.org. Arts Education month is coming to a close, and we need your support! 🎨🎭🎬 Art from local artists has been on display at Piedmont Center for the Arts and for sale online at PiedmontArtsFund.org. “There’s nothing like seeing the art live,” says Big Art Show Chair Siobhan Hughes “but if you can’t make it, it’s really convenient to see the art online.” Online sales at PiedmontArtsFund.org will end at midnight on March 30th, 2019. The proceeds from this fundraiser supports the Piedmont Arts Fund, formerly PAINTS and CHIME, and arts programming at the Piedmont Unified School District. The show comes to a close on Saturday March 30th, 2019. Piedmont Arts Fund supports orchestral music, instrumental and vocal instruction in the elementary schools, jazz and concert band, dance, theater, and art supplies in the Elementary Schools, integrated art in all classrooms, materials for 2D and 3D electives at the middle and high schools, photography, graphic design, ceramics, film, and art books in all of the school libraries. Throughout the year there are performing arts events and visual art shows at the schools. In addition, there are Piedmont Arts Fund events such as the Chalk Art Festival in September, the Big Art Show in March, and the Piedmont Talent Show. Small art parties are also offered throughout the year by community artists for the entire community to enjoy. Piedmont Arts Fund provides essential funding and parent volunteering support for the Visual and Performing Arts at Piedmont Unified Schools in partnership with the Piedmont Education Foundation (PEF). The breadth and depth of these offerings would be impossible to maintain without parent support. Thank you for your support!! A dozen students (elementary through high school) took part in Yancey Labat’s comic book session this past Saturday. Don’t forget our final two events: Thursday, Mar 28, 3 - 5 pm Student Film Viewing at 3:30pm; Sat Mar 30, 12 - 3 pm Closing Concert Event @ 1pm. More details on our website. Link in bio. THIS SATURDAY (3/23) 1-3pm at the Piedmont Center for the Arts Back by popular demand...Come meet DC Comic Illustrator, Yancey Labat for a comic drawing workshop at book signing. He will share his original sketches from his comic book series DC Superhero Girls. Kids will have the chance to make their own comics. He will have a limited selection of his books for sale and to sign. Kids and adults of all ages welcome. Suggested donation: $10/person at the door. Note: this is not a drop-off event.